Cancer is the second leading cause of death in the United States. Treatment is usually multidisciplinary, prolonged, and often debilitating. It can develop at any age. Proliferation of abnormally-dividing cells starts the pathologic process. Genetic abnormalities are passed along daughter cells, eventually producing a tumor or neoplasm that has characteristics quite different from those of the original tissue. Consequently, original cell characteristics are lost. Anaplasia is the loss of cellular differentiation and organization. Autonomy is the ability to grow without usual homeostatic restrictions that regulate cell growth and control. Uncontrolled growth of neoplastic cells will lead to invasion of healthy tissues in the area and metastasis, or traveling from the place of origin to develop new tumors in other areas of the body. Cancers can be divided into two groups: 1) solid tumors; and 2) hematological malignancies. Solid tumors can further be differentiated into carcinomas, or tumors that originate in epithelial cells, and sarcomas, or tumors that originate in the mesenchyme and are made up of embryonic connective tissue cells. The goal of cancer chemotherapy is to decrease the size of neoplasm so that the human immune system can deal with it. Alkylating agents are non-cell cycle specific antineoplastics drugs. They can affect cells even in the resting phase. These are the agents of choice for slow-growing cancers. Reacting chemically with portions of RNA, DNA, or other cellular proteins to produce their cytotoxic effects. Alkylating agents are most potent when binding with cellular DNA. The oldest drugs in this class are nitrogen mustards. Treatment of slow-growing cancers, like lymphomas, leukemias, myelomas, some ovarian, testicular, and breast cancers, and pancreatic cancers. Treatment of pediatric cancers follow developed antineoplastic protocols and combination therapy is stressed to eliminate as many of the mutant cells as possible. Checking the dosage for children is crucial because of possible drug toxicity. In addition, the nutritional needs and hydration status of children should be included in the considerations for formulating a care plan. Even under therapy, children must be allowed to explore and learn like any other children. They would need extra support and comfort as body image problems, lack of energy, and risk for infection can isolate them. Lastly, bone marrow activity should be monitored carefully and dose should be adjusted carefully. Adults are also challenged with changes in body image and activities that come with chemotherapy. It is usual for this age group to fear the diagnosis too. Therefore, establishing a good support system is important. Antineoplastic agents are contraindicated to pregnant and nursing women. Education, support, and referrals to appropriate specialists are important. Women of childbearing age should use barrier contraceptives when these drugs are being taken. Older patients are more susceptible to GI and CNS adverse effects of antineoplastic therapy, particularly those with hepatic and renal dysfunctions. Precautions are used accordingly. Protection from infection and injury should be the focus of nurses. Pregnancy and lactation. Severe effects to fetus and neonate. Known allergy to drugs. Caution is exercised to prevent hypersensitivity reactions. Suppressed renal or hepatic function. Interfere with drug metabolism and excretion. Antimetabolites are drugs that have chemical structures similar to those of various natural metabolites that are necessary for growth and division of rapidly growing neoplastic cells and normal cells. Inhibiting DNA production in cells that depend on certain natural metabolites to produce their DNA. They replace these needed metabolites and thereby prevent normal cellular function. Inhibit thymidylate synthase, DNA polymerase, or folic acid reductase, all of which are needed for DNA synthesis. Considered to be S phase specific in the cell cycle, they are most effective in rapidly dividing cells, preventing cell replication, and leading to cell death. Use has been somewhat limited because neoplastic cells rapidly develop resistance to these agents. Therefore, they are commonly administered as part of combination therapy. Leucovorin is an active form of folic acid that is used to rescue normal cells from the adverse effects of methotrexate therapy in the treatment of osteosarcoma. This group of drugs is selective for bacterial cells. However, they are also toxic to human cells. They are aimed towards rapidly-multiplying cells. They interfere with cellular DNA synthesis by inserting themselves between base pairs in the DNA chain. This causes a mutant DNA molecule, leading to cell death. Treatment of various types of cancer, particularly those with rapidly-dividing nature. These drugs have potentially adverse effects which limit their usefulness in patients with pre-existing disease and those who are debilitated. Drugs that kill cells as the process of mitosis begins. Mitotic inhibitors are cell cycle-specific agents that inhibit DNA synthesis. Interfering with the ability of the cell to divide by blocking or altering the M phase of the cell cycle. Treatment of a variety of tumors and leukemias. Some cancers are sensitive to estrogen stimulation. Estrogen-receptor sites on the tumor react with circulating estrogen, and this reaction stimulates the tumor cells to grow and divide. Hormones and hormone modulators block or interfere with these receptor sites to prevent growth of the cancer and cause cell death. Some hormones are used to block the release of gonadotropic hormones in breast or prostate cancer if the tumors are responsive to gonadotropic hormones. Others may block androgen-receptor sites directly. Blocking the stimulation of growing cancer cells that are sensitive to the presence of that hormone. Treatment of breast cancer in postmenopausal women or in other women without ovarian function. Treatment of prostatic cancers that are sensitive to hormone manipulation. Hypercalcemia. Contraindication to the use of toremifene because the drug can increase serum calcium levels. Hypercalcemia is encountered as the calcium is pulled out of the bones without estrogen activity to promote calcium deposition. These agents are only specific to cancer cells and spare the healthy cells its devastating effects. Patients do not experience the numerous adverse effects associated with antineoplastic chemotherapy. Three groups of drugs are cancer cell-specific: protein tyrosine kinase inhibitors, epidermal growth factor inhibitor, and proteasome inhibitor. Protein tyrosine kinase inhibitors act on specific enzymes that are needed for protein building by specific tumor cells. Blocking of these enzymes inhibits tumor cell growth and division. Epidermal growth factor inhibitors are drugs that act on epidermal growth factor receptors which are found in both normal and cancerous cells but are more abundant on the latter. Proteasome inhibitors are drugs indicated for inhibition of proteasome in human cells, a large protein complex that works to maintain cell homeostasis and protein production. Imatinib, the first drug approved protein tyrosine kinase inhibitor, is given orally and is approved to treat chronic myelocytic leukemia (CML). It selectively inhibits the Bcr-Abl tyrosine kinase created by the Philadelphia chromosome abnormality in CML. Bortezomib is used for the treatment of multiple myeloma in patients whose disease had progressed after two standard therapies. Pregnancy. All drugs in this class is pregnancy category D.
Women of childbearing age. Must be advised to use barrier contraceptives while taking these drugs. Lactation. Can enter breastmilk and use is only justified if benefits outweigh the risks. Hepatic dysfunction. Increased risk of toxicity with imatinib and pazopanib. Risk for prolonged QT intervals (hypokalemia, hypomagnesia, taking drugs that can prolong QT intervals). Contraindicated with nilotinib. Imatinib: GI upset, muscle cramps, heart failure, fluid retention, skin rash. Severe adverse effects of traditional antineoplastic therapy (severe bone marrow depression, alopecia, severe GI effects) do not occur. Antineoplastic antibiotics can increase toxicity of drugs that are toxic to the heart and lungs. St. John’s wort: can greatly increase photosensitivity, which can cause problems in patient who have received radiation therapy or are taking drugs that cause other dermatological effects. In addition, it can decrease the effectiveness of some antineoplastic agents. Assess for the mentioned cautions and contraindications (e.g. drug allergies, hepatorenal impairment, bone marrow suppression, pregnancy and lactation, etc.) to prevent any untoward complications. Perform a thorough physical assessment (other medications taken, orientation and reflexes, vital signs, bowel sounds, etc.) to establish baseline data before drug therapy begins, to determine effectiveness of therapy, and to evaluate for occurrence of any adverse effects associated with drug therapy. Monitor result of laboratory tests such as CBC with differential to identify possible bone marrow suppression and toxic drug effects and establish appropriate dosing for the drug; and liver and renal function tests to determine need for possible dose adjustment and identify toxic drug effects. Arrange for blood tests before, periodically during, and for at least 3 weeks after therapy to monitor bone marrow function to aid in determining the need for a change in dose or discontinuation of the drug. Administer medication according to scheduled protocol and in combination with other drugs as indicated to improve effectiveness. Ensure that patient is well hydrated to decrease risk of renal toxicity. Protect the patient from infection; limit invasive procedures when bone marrow suppression limits the patient’s immune/inflammatory responses. Provide small, frequent meals, frequent mouth care, and dietary consultation as appropriate to maintain nutrition when GI effects are severe. Arrange for proper head covering at extremes of temperature if alopecia occurs; a wig, scarf, or hat is important for maintaining body temperature. Plan for rest periods because fatigue and weakness are common effects of the drug. Monitor patient response to therapy (alleviation of cancer being treated, palliation of signs and symptoms of cancer). Monitor for adverse effects (bone marrow suppression, GI toxicity, neurotoxicity, and alopecia, renal or hepatic dysfunction). These drugs assume the role of the innate defenses of humans in destroying rapidly-dividing cells. Normal cells are always spared from the effects of antineoplastic agents. Drugs boost the immune system in its efforts to combat the abnormal cells and do not necessarily assume its roles. In more traditional antineoplastic chemotherapy, normal cells are also affected. Hence, the severe adverse effects on bone marrow, GIT, and other rapidly-dividing cells. A student nurse was asked to give an example of an antimetabolite. He would be correct to state which drug as an example? Option B is an alkylating agent. Option C is an antineoplastic antibiotic. Option D is a mitotic inhibitor. This is to the point in which the human immune system can deal with it. Which patient complaint would be the least of concern of a nurse taking care of an elderly on antineoplastic agents? Options A, B, and D, may be a sign of hepatic and renal toxicity. At which stage of cell cycle is alkylating agent specific? Antimetabolites are S phase-specific. Mitotic inhibitors alter the M phase of the cell cycle. Antineoplastic antibiotics exert their therapeutic action through which mechanism? They do this by inserting themselves between base pairs in the DNA chain. Option B is for antimetabolites. Option C is the work of mitotic inhibitors. Option D is for hormones and hormone modulators. As part of pre-operative preparation, a patient showing signs of problems with blood clotting should be asked about usage of which herb? It inhibits blood clotting and can cause problems after surgery. Option A can increase the effects of various estrogen hormones. Option B can increase the risk for hepatotoxicity. Option C can increase photosensitivity. How soon after therapy should blood tests be done to monitor bone marrow function? Which drug has been approved for use in treating CML? Which is an absolute contraindication in patients receiving nilotinib, a cancer cell-specific agent? Any condition that can prolong QT interval is a contraindication to the use of nilotinib. All other options can shorten QT interval. A. These drugs assume the role of the innate defenses of humans in destroying rapidly-dividing cells. B. Normal cells are always spared from the effects of antineoplastic agents. 1. Answer: D. None of the above. 2. A student nurse was asked to give an example of an antimetabolite. He would be correct to state which drug as an example? Option B is an alkylating agent. Option C is an antineoplastic antibiotic. Option D is a mitotic inhibitor. 3. Answer. B. To decrease the size of the neoplasm. 4. 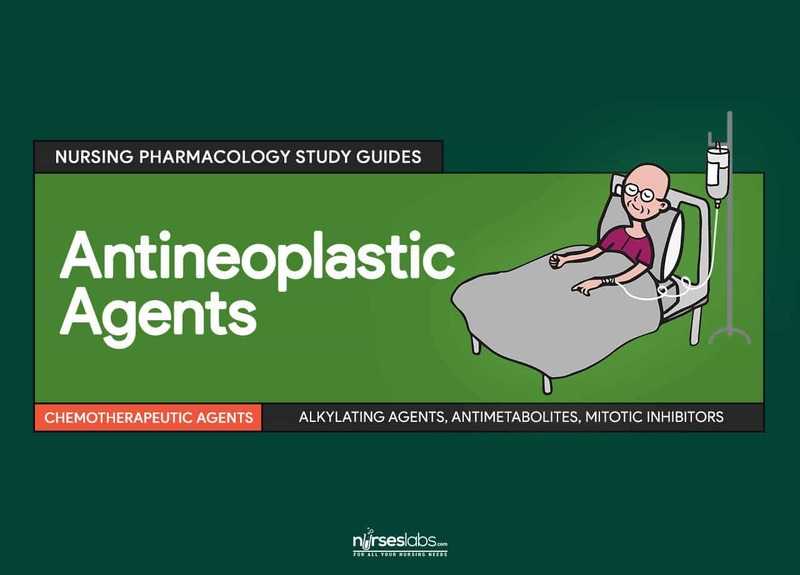 Which patient complaint would be the least of concern of a nurse taking care of an elderly on antineoplastic agents? 4. Answer: C. keloid formation on previous IV site. 5. At which stage of cell cycle is alkylating agent specific? D. None. It is non-specific. 5. Answer: D. None. It is non-specific. 6. Antineoplastic antibiotics exert their therapeutic action through which mechanism? C. Preventing the cells to divide. 6. Answer: A. Causing a mutant DNA molecule. 7. As part of pre-operative preparation, a patient showing signs of problems with blood clotting should be asked about usage of which herb? 8. How soon after therapy should blood tests be done to monitor bone marrow function? 8. Answer: C. 3 weeks after. 9. Which drug has been approved for use in treating CML? 10. Which is an absolute contraindication in patients receiving nilotinib, a cancer cell-specific agent?